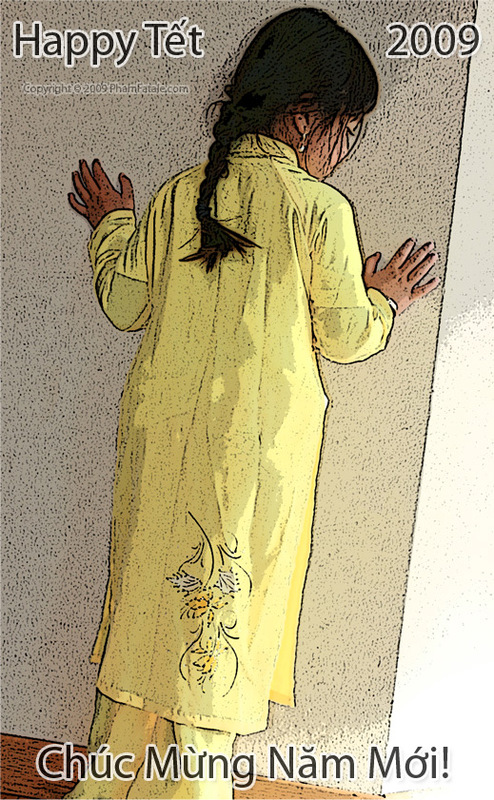 This is a picture of my youngest sister-in-law in a traditional Vietnamese dress called an ao-dai. This is a very special new year for my family. Not only is there the usual celebrations, that ring in the Asian new year, called Tet in Vietnam, but it's also my oldest-sister-in-law, Sunny's 13th birthday. Yup, we gotta a teenager in the house. We decided to combine the celebrations into one big party. As is tradition, we've prepared a platter with an abundance of tropical fruits. I've taken pictures of some of the exotic fruits from Vietnam that you may not be familiar with. We also made egg rolls, chow mein and roast duck. 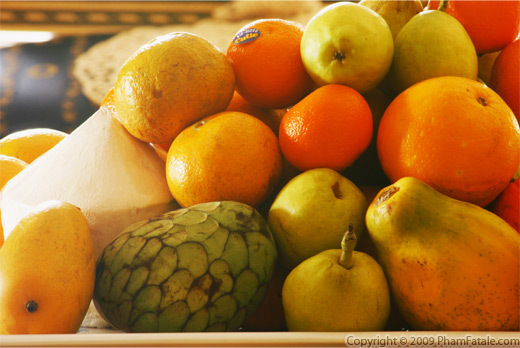 Tropical fruits: cherimoyas (also called custard apples), coconut, mangoes, guava, papaya, Asian pears. You can create a very exotic savory salad combining cubed cherimoyas, shredded lettuce, julienne strips of chicken or fried tofu, bell peppers and red onions. Serve with a mandarin vinaigrette and you have a delicious healthy first course for dinner. 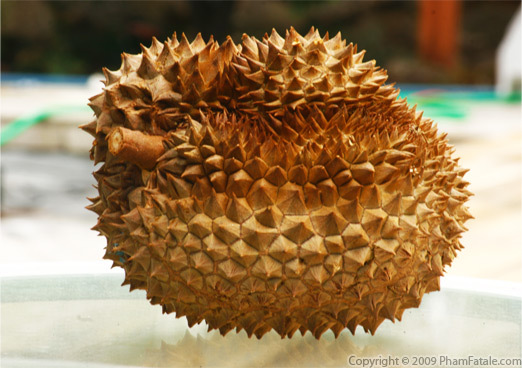 This is a durian. The smell can be unpleasant (Lulu would call it overwelmingly foul) for some people, kinda like a gas leak (my husband definitely can't bare the smell nor taste !?!). And if you like to eat it, durian is very sweet and creamy. The best ones are from Thailand. 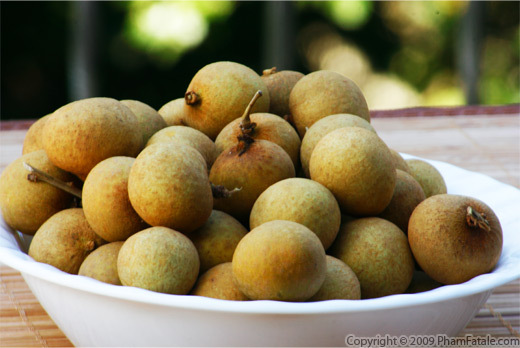 This is longan. It has a more subtle taste than litchis but there are still very flavorful. We tried to plant a tree in our orchard but it still hasn't fruit. I guess the weather is not hot enough in Northern California. The fruits pictured above were store-bought and are grown in South Florida. 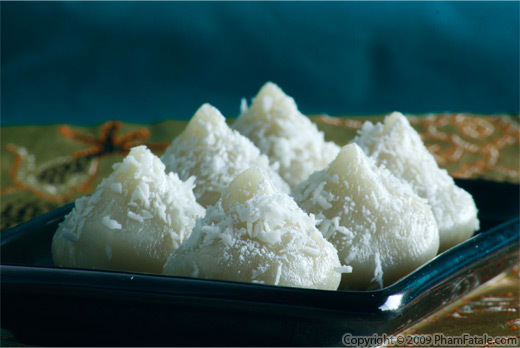 We made some chocolate filled coconut sticky rice dumplings. I made some coconut flavored sticky rice balls but instead of making the traditional split mung bean filling, I stuffed the dumplings with chocolate. I steamed them then roll them in freshly grated coconut. It's delicious and cholesterol free. 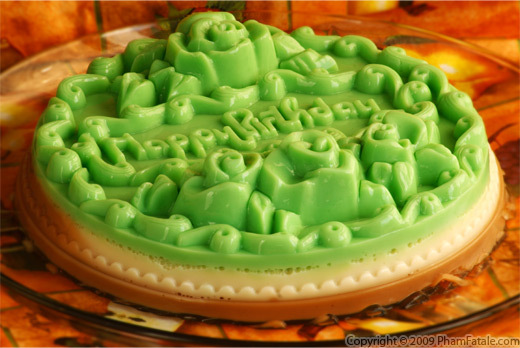 We also prepared a rau cau (Click here for recipe) which is a traditional Vietnamese jello cake made with agar agar which is a seaweed by product similar to gelatin. It's made out of coconut milk, condensed milk and layers of your favorite flavorings like mocha, vanilla, coconut, banana, chocolate and durian (if you're adventurous!). 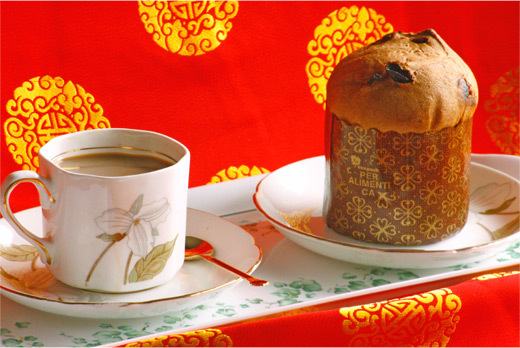 It goes great with Vietnamese coffee, check out the recipe on the link. So from my family to yours, Happy New Year! 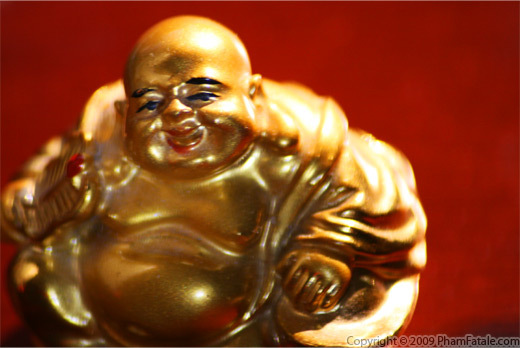 I hope the Year of the Ox brings you happiness, good fortune, and of course great food! I have no idea what's in it, but it's tasty. Chúc Mừng Năm Mới! One more day to go before it's all over with. 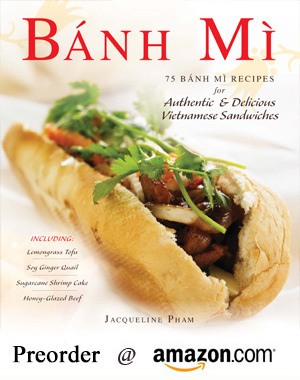 Jackie, thank you so much for your generous spirit in sharing the food you love to make. Your style and creativity are awe-inspiring. Your easy manner and excellent writing skills make a novice want to give your loveliest recipes a try. I'm wondering if you can help me with something I've been looking for. I was friends in Houston with a beautiful Vietnamese girl and she invited me to her home a few times for family parties. A family member always brought the same cake and it was inhaled within minutes. I could never even get the name of it, unfortunately. The cake is similar to an angel food cake in color and texture but is 10 times lighter - it really felt like eating delicious air. The frosting was a white sweet frosting but, it too, was somehow whipped to an incredible delicate lightness. There was just enough sweetness to make it more-ish but one could easily imagine eating the whole cake and not even feeling sick from the sweetness. Would you have any idea that would point me to a recipe?